Tuberculosis (TB) accounts for millions of deaths worldwide every year. Diverse survival strategies adopted by Mycobacterium tuberculosis (Mtb) have substantially hindered the existing anti-TB regimen thereby leading to multidrug-resistant (MDR) and extremely drug-resistant (XDR) strains of TB. The steady decrease in current antibiotics’ efficacy against these adversities is an indicator that their adequate replenishment in future is almost impossible, placing society on the precipice of a catastrophe. Over the past many years, researchers have been continuously generating new armamentarium of anti- TB drugs by tailoring the properties of available drugs or designing completely new agents. One of these emerging and successful synthetic techniques is molecular hybridization (MH) that involves the integration of different pharmacophoric subunits to form a new prototype with the ability to be recognized by multiple receptors. In most cases, the resultant conjugates have been reported to exhibit superior biological activity profiles relative to their parent molecules which is attributed to their different or dual modes of action. Accordingly, several new effective anti-TB scaffolds have been synthesized using this approach, and are well cited in literature. In this review, we provide a summarized account of the chemical strategies optimistically focused to develop new molecular assemblies for TB via MH approaches. Additionally, the structure activity relationships revealed from different biological assays is systematically discussed. 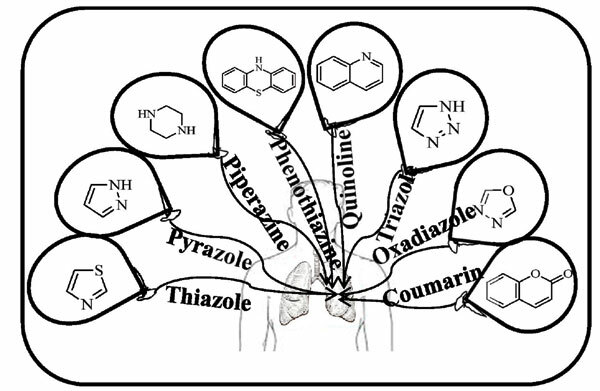 Keywords: Molecular hybridization, drug resistance, tuberculosis, Mycobacterium tuberculosis, anti-tuberculosis drugs, structure activity relationship. Keywords:Molecular hybridization, drug resistance, tuberculosis, Mycobacterium tuberculosis, anti-tuberculosis drugs, structure activity relationship. Abstract:Tuberculosis (TB) accounts for millions of deaths worldwide every year. Diverse survival strategies adopted by Mycobacterium tuberculosis (Mtb) have substantially hindered the existing anti-TB regimen thereby leading to multidrug-resistant (MDR) and extremely drug-resistant (XDR) strains of TB. The steady decrease in current antibiotics’ efficacy against these adversities is an indicator that their adequate replenishment in future is almost impossible, placing society on the precipice of a catastrophe. Over the past many years, researchers have been continuously generating new armamentarium of anti- TB drugs by tailoring the properties of available drugs or designing completely new agents. One of these emerging and successful synthetic techniques is molecular hybridization (MH) that involves the integration of different pharmacophoric subunits to form a new prototype with the ability to be recognized by multiple receptors. In most cases, the resultant conjugates have been reported to exhibit superior biological activity profiles relative to their parent molecules which is attributed to their different or dual modes of action. Accordingly, several new effective anti-TB scaffolds have been synthesized using this approach, and are well cited in literature.